2001 Clear, polyester tape with a high tack acrylic-based adhesive 6.5 120 oz. Permanent Bonds wood, marble and other smooth surfaces. Ideal for promotional displays, splicing paper and plastic films. Bonding to plastic and metal profile extrusions and decorative trim. 3M583 3M heat activated dry film adhesive with a thermosetting adhesive 2 N/A Permanent Heat activates film, making permanent bond to printing dies, embroidered emblems. 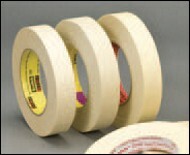 3M665 Clear, UPVC, linerless and repositionable tape with an acrylic-based adhesive 3.5 25 oz / 23 oz. Removable Engraving table beds, router table, re-closable bags or envelops, core starting and end tabbing, P.O.P. displays. A200 Clear, polyester film tape with a medium tack acrylic-based adhesive; available with extended liner 3.5 94 oz. Permanent P.O.P. displays, badge ribbons, signage, splicing and laminating. 514 Clear, polyester film tape with a medium tack acrylic-based adhesive 3.5 40 oz. Permanent High performance splicing of papers, plastic films and other web processes. Bonds metals, HSE plastics and composite materials. BIGRED Clear, PVC film tape with an aggressive high temperature acrylic-based adhesive for demanding temperature applications 8 63.5 oz. Permanent Adhering acrylic, Plexiglas, ABS plastics, scrapbooking and low energy substrates to a wide variety of smooth substrates, UV and temperature resistance and scrapbooking. FabTac Clear, polyester tape with a high tack acrylic-based adhesive 3.5 94 oz. Permanent Mounting and securing delicate fabrics and needlework. JR2022 Clear, PVC tape with a high tack acrylic-based adhesive 6.5 110 oz. Permanent Mounting of nameplates, vinyl textiles, banner hems, splicing of paper, plastic films, core starting and general purpose assembly. JR972 White, PVC film tape with an aggressive acrylic-based adhesive; also available in disks 8.3 88 oz. 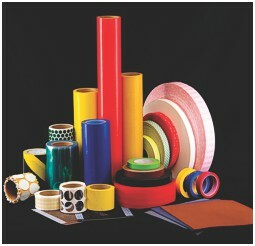 Permanent Mounting and bonding wood, marble and other smooth substrates. Ideal for promotional displays, splicing of paper and plastic films. 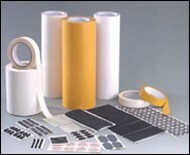 Tesa 4968 White, PVC film tape with an aggressive acrylic-based adhesive for demanding temperatures 11.6 95.9 oz. Permanent Bonds to the "toughest" smooth substrates. Used for automotive trim and side mirror, signage and P.O.P. display assembly. Tesa 4970 Opaque, UPVC tape with a high tack acrylic-based adhesive 9.4 123.3 oz. Permanent Mounts plastics and wood, signs, P.O.P. displays, banner hems and decorative trim. Applications in the Appliance industry for promotional displays and splicing paper. TH297 Clear, polyester tape with a medium tack acrylic-based adhesive 3 63.5 oz. Permanent Encapsulating framing documents, wooden filets on mat board window, sailboat seaming, splicing of paper, plastic films and cloth, ribbons on hairbows.